As you know, we have decided to suspend our participation in the CompArte Festival. Of course, for those who know how to read carefully, we didn’t say that the festival itself was suspended. We merely indicated that we as Zapatistas would not be able to contribute. So if someone thought the former and decides not to participate, well then we apologize because we know you already took on expenses. No one should give orders to the Arts. If there is a synonym for freedom, perhaps the last bastion of humanity in the worst situations, it is the arts. We Zapatistas neither can nor should—nor has it even crossed our minds—to tell the workers of art and culture when they should create or not. Or worse, impose a topic on them and, using the originary peoples in rebellion as justification, drag out concepts of “cultural revolutions,” “realisms,” and other arbitrary notions that merely hide what is some kind of cop determining what is “good art” or not. No, artist sisters and brothers [hermanas, hermanos, hermanoas]; for us Zapatistas, the arts are the hope of humanity, not a militant cell. We think that indeed, in the most difficult moments, when disillusionment and impotence are at a peak, the Arts are the only thing capable of celebrating humanity. For us Zapatistas, you, along with scientists [l@s científic@s], are so important that we cannot imagine a future without your work. But that is a subject for a later letter. The task here is to honour a commitment to you all. As of June 15, 2016, the last day for registration, we had a report prepared to let you know how the CompArte Festival was coming. Unfortunately, the national situation got progressively tenser (thanks to the irresponsibility of that child with a box of matches who works out of the SEP [Department of Public Education]), and we kept postponing it until coming to the decision that we have already told you abou t.
There are 1,127 national artists and 318 artists from other countries registered. The oldest participating artist is a singer-songwriter who is around 80 years old, although he looks much younger (you’re welcome, Oscar). His songs, which revive popular culture and its musical parodies (surpassed only by reality), are still heard in the Zapatista mountains, and perhaps in some of the places where the teachers resist. The youngest participating artists are: a 6-year-old boy who dances Son Jarocho with the Altepee collective; the Children’s Choir of Huitepec whose ages range from 3 to 11-years-old; a little girl, 10-years-old, who plays the cajón de tapeo with the Banda Mixanteña of Santa Cecilia: and a little girl, 10-years-old, who plays the piano. Should CompArte happen? That question is for all of you. And the answer should include how, where, and the customary etceteras. We think that if you are capable of aweing the world with your work, you can surely organize yourselves to celebrate humanity in the face of the machine. Comandante Zebedeo also told us: “one compa came up to me and said that the situation was pretty bad, that he thought maybe they wouldn’t be able to have the festival because of all the attacks against the teachers. But he was happy because, as he said, “I didn’t know I could sing; now I know I can sing and I can even create my own songs where I talk about how we Zapatistas do things. Even if there isn’t a festival, I’m happy. What’s more, even if it doesn’t happen this time, perhaps we can do it another time. 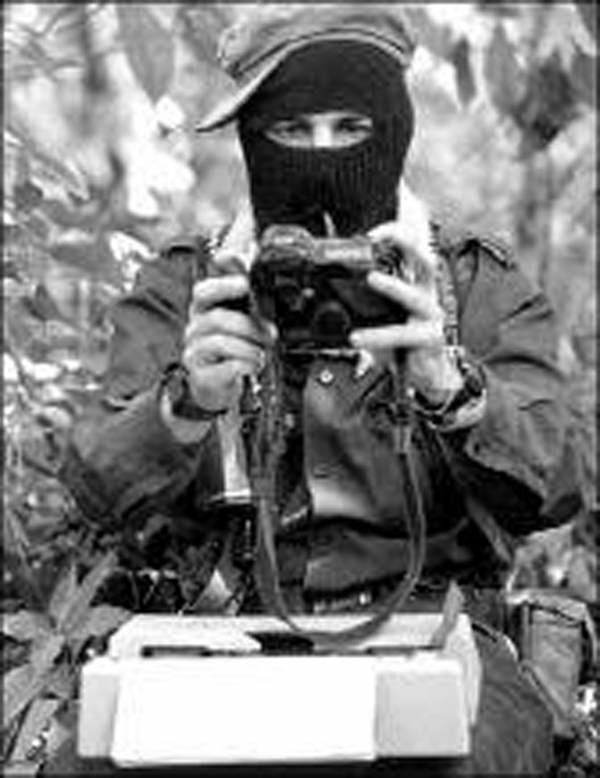 And if you, artists, compas of the Sixth, are trying to imagine what the Zapatista artistic contributions would be like, well we’re including a video here. Maybe another day we’ll put up more, or maybe photos, because we really struggle with this internet thing. This dance in the video was created by a collective from the Altos zone, in the caracol of Oventik. We don’t know if it’s called dance or choreography, but it is called resistance and the music is a mix of the track by Mc Lokoter “Esta tierra que me vio nacer” [This land birthed me], and a ska track, “El Vals del Obrero” [The Worker’s Waltz] from the Spanish group SKA-P. The MC at the beginning explains the meaning of the dance. The video was produced by “Los Tercios Compas” in one of the selection rounds for who would go to Oventik, a little over two months ago (meaning, we didn’t suspend our participation because we weren’t prepared). Here it is. Aaaaaaaaah jump! Well, now that we’ve caught our breath, we want to give you as much detail as possible about the material support that we are taking to the teachers in resistance in various parts of Chiapas, Mexico, as a sign of our solidarity, respect, and admiration. Tojolabal, Zoque, Mame, Chol, Tzeltal, Tzotzil, and Mestizo artists from the 5 caracoles were going to participate as listeners on behalf of the Zapatista bases of support. From the Caracol of Roberto Barrios (Northern zone of Chiapas) 254 artists and 80 listener-observers. From the Caracol of La Realidad (Selva Fronteriza zone): 221 artists and 179 listener-observers. From the Caracol of Garrucha (Selva Tzeltal zone): 311 artists and 99 listener-observers. From the Caracol of Morelia (Tzotz Choj zone): 276 artists and 88 listener-observers. From the Caracol of Oventik (Highlands zone of Chiapas): 757 artists and 1,120 listener-observers. Total: 1,819 artists and 1,566 listener-observers. Grand total: 3,385 men, women, children, and elders, Zapatista bases of support. Food as an art of resistance. The resources set aside for the Zapatista artists varied according to each caracol, because the cost of things can be pricier or cheaper in different places. But the average food expense was $12.08 pesos per Zapatista artist per day. Everything we had put together for our participation, including all five caracoles, amounted to $290,000.00 (two hundred ninety thousand Mexican pesos). Of course, that’s before the next currency devaluation…err, yes, apologies, no more spoilers. Where did the money come from? From the INE [National Electoral Institute in Mexico]? From the PROSPERA [government aid] program? From organized or disorganized crime—that is, the bad government? From some NGO? From a foreign power interested in promoting the Arts in order to destabilize Mexico’s “tranquillity?” No compas, the money came from the work of the production collectives across the communities, regions, and zones, as well as from the MAREZ [Zapatista Autonomous Municipalities in Rebellion] and the Good Government Councils. That is, it’s clean money, earned the way the immense majority of people of Mexico and the world earn: from work. Is it a lot or a little? Now, what are they going to do with all that? What are they going to donate to the teachers in resistance? A commission from the caracol of La Realidad will deliver all of this to the teachers in resistance in Comitán, Chiapas, July 9, 2016, at…well, as soon as they get there. 1,000 kilos of chayote, yams, yucca, and plantains. A commission from the caracol of Roberto Barrios will deliver all of this to the teachers in resistance in Playas de Catazajá, Chiapas, July 8, 2016. A commission has already gone there to arrange things with the teachers there for the delivery. A commission from the caracol of La Garrucha will deliver all of this to the teachers in resistance in San Cristóbal de las Casas, Chiapas, July 9, 2016. A commission from the caracoles of Morelia and Oventik will deliver all of this to the teachers in resistance in Tuxtla Gutiérrez, Chiapas, July 10, 2016. We won’t deliver all of the tostadas at once because there are a lot and they would get mouldy. Better a little to start with and then more later. So that’s how things are, compas of the Sixth and artists and teachers in resistance. Now, if you ask us what we think about you coming or not, we say clearly: come. Chiapas is beautiful. And now even more so with the teachers’ resistance flourishing in the streets, roads, highways, and communities. [i] Folk art sculptures of fantastical animals, a craft native to Oaxaca. [ii] Artisanal craft of the construction, repair, and maintenance of stringed instruments.